Tuitions and other college-related expenses are at all time highs. The ability to earn your way through school is on the decrease. Cost pressures continue to be a deciding factor of the burgeoning dropout rate. Student loans are easily obtainable but are not dischargeable in a bankruptcy like other notes. Unemployment among recent graduates is relatively high. So of course today’s college students, faced with this high stakes situation, respond with an extra dose of prudence and caution, right? Unfortunately, no. 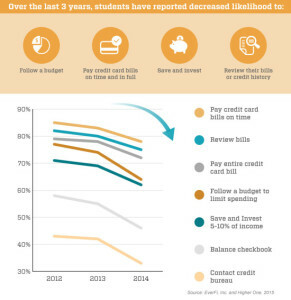 This chart, brought to us by moneymattersoncampus.org and highlighted in an article in USA Today by Calley Hair, shows a declining tendency among students to do even the most basic of financially responsible items, such as budgeting and reviewing financial statements. Many of today’s students are both unprepared to handle money while facing bills that would overwhelm the most astute of us. As a result increasing numbers simply give up and ignore the situation, with predictable consequences in store. How to address this then? Parents and mentors- you MUST get involved in walking students through financial decisions. Students- you MUST get parents and mentors involved in your financial affairs. We all need to sit down and talk money. We need to open up the family books and expose ourselves to a little embarrassment. We need to talk turkey on earning, spending, saving, and investing before college. Otherwise, if we keep doing what we’re doing we’re gonna keep getting what we’re getting.